1.Hello, Georgius! Tell when did you became a metalhead and if you played in any other bands before Castrum! Hail Sorin! First of all a big thank to you for the interview and the interest too! 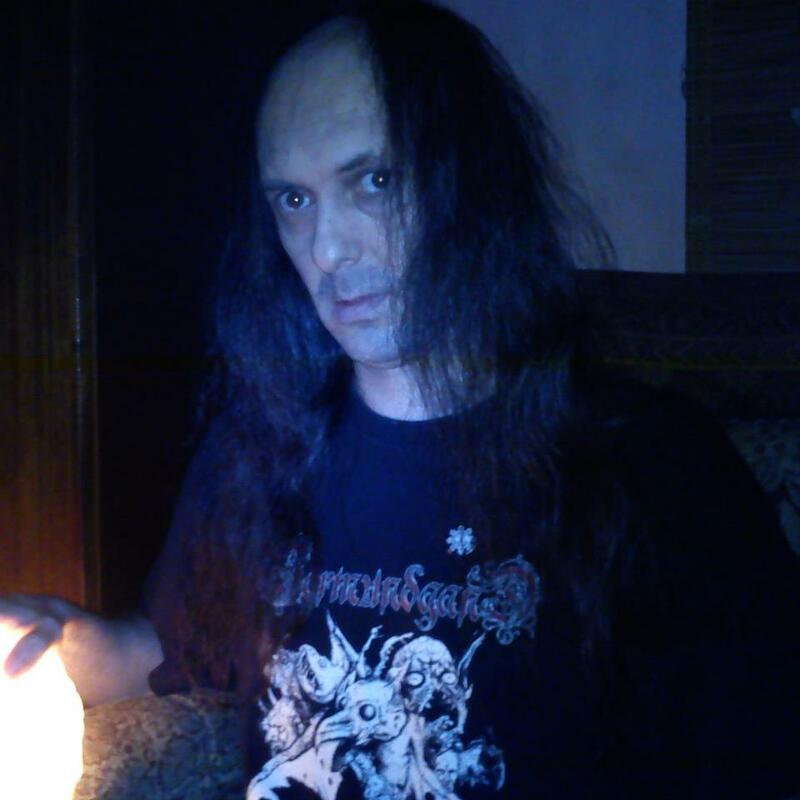 Well, I became a metalhead in autumn, in 1987 after the listening to two tapes of Iron Maiden (Number of the Beast) and Mercyful Fate (Don’t Break the Oath). Before that I’ve listened to some hard rock/heavy metal bands but these tapes definitely changed my life and I think I’ve „engaged” myself with metal to the end of my life…. As an answer to your second part of your question, unfortunately no, I didn’t played in any other band before Maleficium/Castrum. Maleficium was formed in September, 1994, when together with my good friends, Cornelius (guitars) and Lancelot (drums) we've decided to create a death metal horde. Lancelot needed to leave us for the Ukranian military service that year and after a long search in September of 1995, Werkoff (drums) joined the band. (At the same time we changed Maleficium name for Castrum. Castrum has a lot of meanings, for us: Tower of Witches. I would to notice that old Latin name of our hometown was Castrum Ungh, so it has been absolutely a good choice to the members of the band). In February 1996 we recorded our first demo called ”Burial of the Affection” which contained 7 tracks and this demo was sent to Hungarian Metal Hammer to Olly Zubor for the review. Just a few months later in May/June we entered the ”Impertinence Studio” to record our first studio demo called ”Flames by Impiety”, which included 2 tracks +intro/outro of medieval death metal and was produced by Cornelius personally. In October 1996, Castrum recorded 3 new songs for the second studio demo ”Pleasure in the Deeds of Horror”, produced by Eugene Petrus and Cornelius. This demo was very well received by the underground press and fans worldwide. Some thoughts about lyrical conception of Castrum: mostly deals with historical events but there were some lyrics based on the band members’ personal experiences too(„Rapid Death” and Source of Hate” tracks). Werkoff was compelled to leave the band, due to the complications took part in his family life. In the summer of 1997, he had been replaced with drummer Doni of Soulrest (another death metal band from our hometown). It was my last live show with Castrum in February 1998, and later, in early autumn I left the band for my studies in Hungarian town, Szeged. Cornelius continued Castrum, of course, apart of the guitar he became as a vocalist as well. In September 1999 the horde signed a deal with the Ukranian underground label Metal Force Records. The first result of it was a MC release unleashed under the banner of ”The Leading Spirit of Medieval Tortures” (MC 002), which contained a collection of almost all the early materials of Castrum with my vocals. In the fall of 2000 Metal Force Records released the band’s debut album ”Hatenourisher” in MC format. It followed shortly a record deal with Canadian Bloodbucket Productions and ”Hatenourisher” was out in CD format as well in 2001. The second Castrum CD”Mysterious Yet Unwearied” was released in December of 2002. The band’s third album, titled ”Phenomenonsense” was released through Bloodbucket Productions late 2006. Castrum’s ”The Essence of the Past” DVD was compiled by Cornelius from old archive shows, clips, demos and released in December 2007, it contains all the early stuff with Werkoff and me…..
4.Why did you left Castrum? Did you played in other bands during this time? As I’ve mentioned before, I left Castrum for my studies in Hungary. It was a sorrowful choice for me. I played with my Hungarian friends a few Slayer, Kreator and Metallica-covers in their rehearsal room just for fun but we didn’t record anything and didn’t played live gigs…. 5.Tell about your activity in the black metal band Domhring! 6.You're a hungarian from Ukraine. How was the scene through all these years(in your vision, in both countries)? Any recommended Ukrainian bands? Well, my hometown had and has a lot of bands with different styles during my Castrum-times and nowadays as well but I can’t speak about it as a scene…. I don’t know really what was the situation in other parts of Ukraine but I think, Kharkiv/Kharkov has always been a strong metal scene. Some recommendations: Castrum, Soulrest and Reusmarkt (from my hometown). Also: Nokturnal Mortum, Khors, Drudkh, Kroda, Dub Buk, Mental Demise, Datura, Sidus Mortuorum…. About Hungarian scene… hmmm…when I played with Domhring I’ve seen a lot of great bands at live shows and talked with musicians too and in my opinion Hungarian scene since Tormentor-era produced and produce some excellent hordes these days as well. 7.What recommendations from Hungary can you have? Sear Bliss, Bornholm, Casketgarden, Mörbid Carnage, Nadir, Athame…. 8.Your Top 10 favourite albums of all time? 9.What are your favourite 2012 albums? Grave: Endless Procession of Souls etc. 10.What are your future plans? 11.Are you now interested in joining one of your old bands? What about resurrecting Chamos under another name? Castrum and Domhring are both were nice parts of my life and we had a lot of great experiences together… These bands have complete line-ups now, so I think my personality it’s not necessary to them. Chamos it's in his grave, but of course it would be great to record these tracks from Hellish Reveries rehearsal-demo some day…..
12.Do you think of yourself as a metal legend? Hihihi. Are you jocking, aren’t you? 13.I wish you all the best, and add some final (wisdom) words!!! Mersi, Sorin! It was a pleasure to answer you these questions. Stay metal! Hail Chaos…….